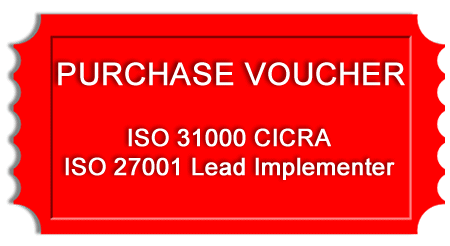 Pre-paid voucher credit code valid for ISO 27001 Lead Implementer certification resources at www.certifiedinfosec.com. This pre-paid purchase voucher is valid for 180 days from the date of purchase. Need to train and certify your team? What is a "Pre-Paid Credit Voucher"? Upon completion of your purchase, a custom purchase voucher code will be immediately generated and emailed to you. To use the voucher code, you will simply complete a purchase for the above products (direct links provided) as usual at our online e-store, and enter the voucher coupon code in the "Enter your coupon code" field. Any credit remaining on your voucher will be applied to the sales price, and will be deducted from your future available credit. The voucher can be used as payment as many times as you wish until the credit balance is completely depleted, or until the voucher expires. Your voucher code expires 180 calendar days from the original date of purchase. Any unused balance upon expiration is forfeited, and is not refundable for any reason. Remember, your discounted voucher code may not be used to purchase products other than those listed above. Once the candidate completes Step #1, the candidate is ready to purchase and take your online certification exam corresponding to the previous course: Certification Exam #RM101. Once the candidate completes Step #3, the candidate is ready to purchase and take his or her first online certification exam corresponding to the previous course: Certification Exam #ISMS101. Submit 3 candidate endorsements. Download a candidate endorsement form and instructions here. Have questions? Need further assistance? Contact us.